After the profusion of ramen bars in recent years, the legendary Momofuku’s David Chang may have declared that ‘ramen is over’ — but what of the homelier udon? This thick, cream-coloured wheat flour noodle is typically served in a light dashi (Japanese broth) that’s ideal comfort food for freezing weather. Said to be less calorific than ramen or soba, it’s currently enjoying a renaissance of popularity in Japan. 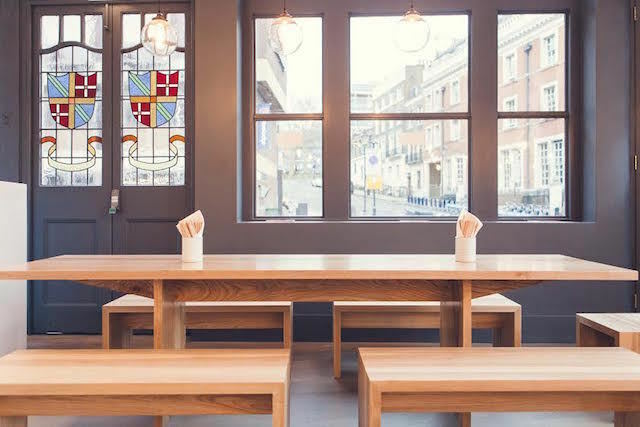 Owned by a Japanese design company, Den opened its first UK outlet in King's Cross just before Christmas. Although udon is very much the focus here, there are also a few donburi dishes (rice with toppings or accompaniments) and tsumami (Japanese snacks and nibbles – not to be confused with tsunami). Everything, including the noodles and dashi, is made on-site by chef Emi Machida — previously of Koya and Bone Daddies — and her all-Japanese team. 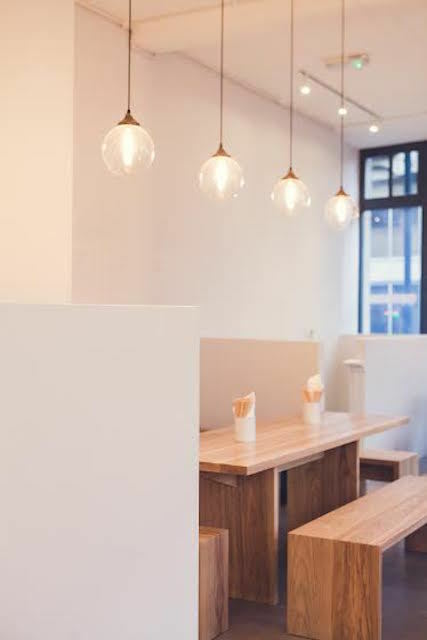 The small venue has the typical look of a Japanese canteen: all stark cream walls and blonde wood bench seating, with menus doubling up as place mats. 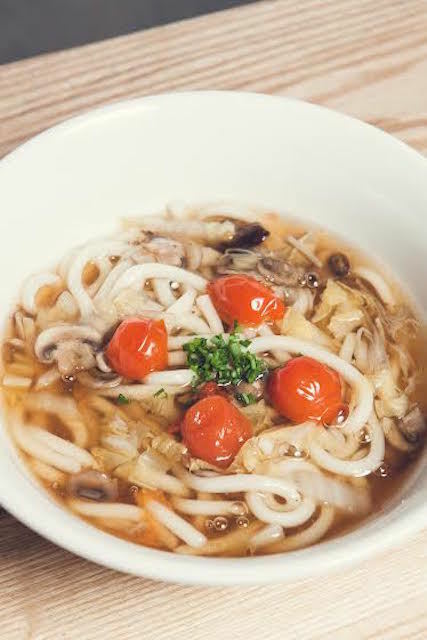 For meat-free diners, there are a few hot udon soups made with white vegetarian dashi, and cold noodles with dipping sauce containing black dashi. The white dashi is flavoured with dried mushrooms and kombu (kelp seaweed) instead of bonito fish flakes; and a touch of sweetness and acidity is provided by sun-dried tomatoes and balsamic vinegar to balance out the flavours. (Other than these, there are fewer fusion elements here than in many other Japanese restaurants). The black dashi is simply enriched with soy sauce. In Japan, the difference between the two types is regional, but also prone to personal preference. Also on the menu are a few veggie donburi and tsumami dishes. 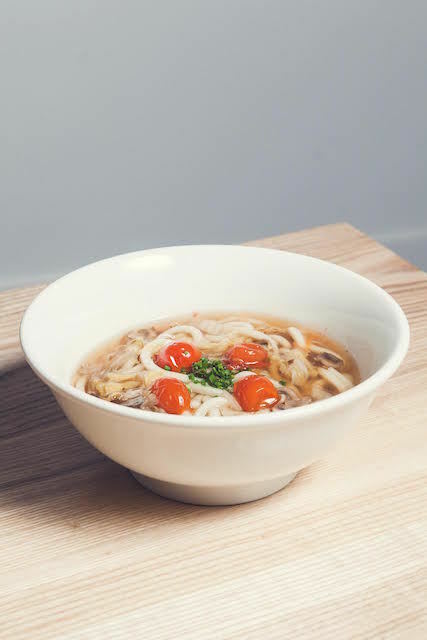 Our ‘mixed vegetables in thick gravy’ udon has been thickened with sweet potatoes rather than miso, and contains a few Chinese cabbage leaves and mushrooms, brightened by a garnish of cherry tomatoes. The dashi tastes subtle, austere and elegant, understated yet flavoursome with a slight, intriguing back note of smokiness. Shichimi togarashi (Japanese seven-spice chilli pepper), automatically brought to the table with the soup, livens it up, and extra toppings of seaweed, spring onions and little nuggets of crispy tempura batter further enhance the taste and texture. There are no big show-off flavours like you get with the revered ramen; the earthier udon is meant to be humble and more pared down. From the tsumami list, ‘pickled seasonal vegetables’ featuring lightly piquant daikon slices and carrot shreds are fine if unexciting. Japanese green tea is an ideal accompaniment, but there are also a few beers, spirits, wines, cocktails and shochu. When we asked whether the hot saké was available by the glass rather than carafe, we were handed a complimentary glass (perhaps because staff were unsure how to price it). Service, particularly from the Japanese ‘floor manager’, is delightfully chatty, friendly and well-informed. No desserts are available though; plum wine is about as sweet as it gets. We paid around £15-£20 for udon with extra toppings, pickles, drinks and service. We inadvertently visited mid-January during the soft launch period (the trade press mentioned early January as the official opening date), and were informed that the restaurant, in fact, formally opens on 5 February. Apparently the current menu is being tested, and may be overhauled with several more vegetarian dishes introduced. Ramen is dead, long live udon. Den, 2 Acton Street, WC1X 9NA. Tel: 020 3632 1069. Images supplied by the restaurant. We review strictly anonymously, and pay for all the meals, drinks and service.